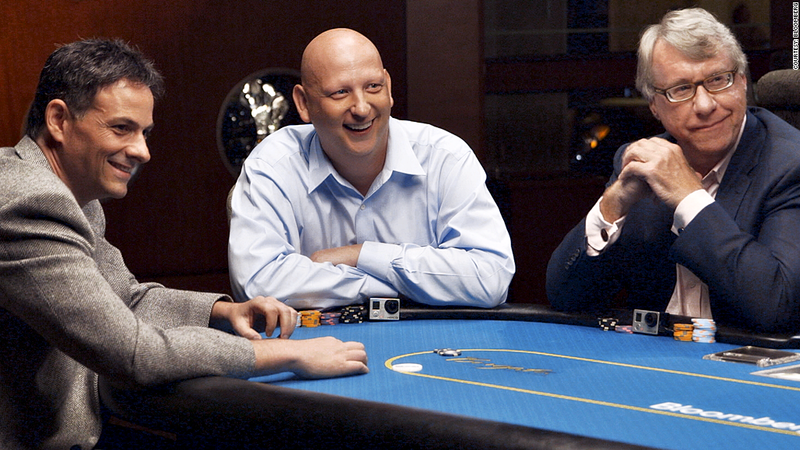 David Einhorn, Steve Kuhn and Jim Chanos competed in "Poker Night on Wall Street," a charity event. Six of the world's top investors appear capable of playing great poker -- they're just not doing it yet. After watching "Poker Night on Wall Street," a charity event that aired Wednesday on Bloomberg TV, it's clear to me these competitors have an aptitude for the game. I make this judgment based on what they said; not so much on what they did. Matt Matros has won three World Series of Poker bracelets, and his career tournament winnings exceed $2 million. He finds the poker economy a lot more predictable than the actual one. Take Jim Chanos of Kynikos Associates, who described himself as a "natural-born skeptic." That's a wonderful thing for a poker player to be! Amateurs will readily believe their opponents have good hands, but the stories told by betting patterns are often just that -- stories. His contrarian philosophy has helped make Chanos a lot of money in investing, and it could eventually serve him well in poker. But first he has to learn how to move all-in with a short stack. Now consider Mario Gabelli of GAMCO Investors. He rated his chances of winning as "slim," and said he didn't consider himself good at bluffing or reading people. Such honest self-assessment is a hugely important quality in poker. Gabelli, though, said he had only played poker once, seven years earlier. Wednesday night he played...well, like someone who'd played poker only once. Then there's John Rogers of Ariel Investments, who professed that patience at the table was his number one priority. Again, a commendable approach. The biggest sin committed by new players, by far, is impatience. Rookies play way too many hands. Still, if you never pull the trigger on a trade, you'll never make any money in the market, and if you never play a hand of poker (which seemed to be Rogers's strategy), then you have no shot to win. The good news is that when smart investors apply their talents to poker, they can climb the learning curve quickly. Two of the players have taken the game seriously, and they have winnings to show for it. David Einhorn of Greenlight Capital finished third in the million-dollar buy-in One Drop event at the 2012 World Series of Poker, while Bill Perkins of Skylar Capital took home nearly 300,000 British pounds in a London event just a few weeks ago. Neither Einhorn nor Perkins advanced very far in Wednesday night's event, but that was mostly because of bad luck. Einhorn, in particular, has impressed many regulars on the tournament circuit. Poker pro Mike McDonald, who coached Einhorn for his final table appearance at the One Drop, said of his student: "He's possibly the most active listener I've ever met. Very few people are as good as he is with so few hours played." The problem is, those extra hours are everything. In the same way years of experience separate Einhorn from talented traders just out of Wharton, many thousands of hours of play and study separate the best poker players from Einhorn. There are no shortcuts in either discipline. The eventual winner of Poker Night on Wall Street, Steve Kuhn of Pine River, played well enough, and was clearly the most skilled competitor not named Einhorn or Perkins. Kuhn also understood, even in the moments right after he won, that taking up the game in a more competitive manner wouldn't be easy. When the possibility of playing poker full-time was broached, Kuhn wisely brushed it off: "I kinda like my job already," he said.